Multiple buddhas adorn the alter of the Wat Phra Singh. Chiang Mai, Thailand is an historic, exciting and active place in the middle of a gracious and gentle country. Among the highlights is touring some of the more than 300 wats (Buddhist temples) in town. Over 90 percent of Thai residents identify themselves as Buddhists, which is one reason why there are as many wats in Chiang Mai as in Bangkok. 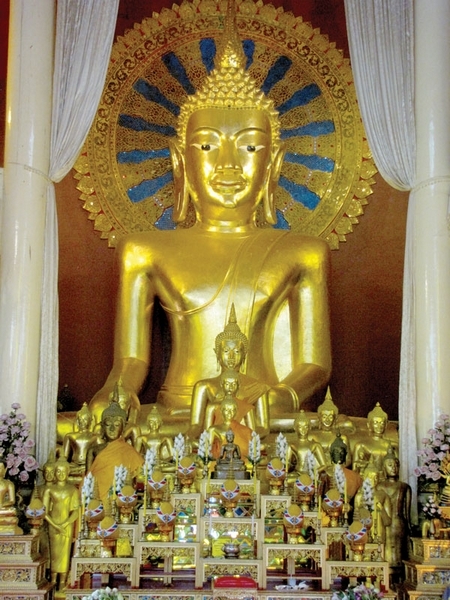 It’s an active and thriving community with many orange-clad monks in service maintaining these historic, holy sites.We selected two wats to visit, each special in their own right – The Wat Chiang Man and the Wat Prah Singh. The Wat Chiang Man is the first and oldest wat in the city, dating back to 1292. It’s an excellent example of Lanna-style architecture, decorated in rich, red lacquer, multi-colored mirrored glass and opulent gold leaf. Elaborate murals decorate the walls that house two sacred and ancient Buddhas – the crystal Buddha and the marble Buddha, each nearly 2,000 years old. Moving on to the next wat, we rode in a “tuk-tuk,” a three-wheeled, covered scooter-like taxi, splashing through puddles, as we made our way to the Wat Prah Singh. Another fine example of Lanna architecture, this wat is important mostly because of the Buddha for which it is named. The Lion Buddha is a very rare and sacred image, and it’s believed that only a few exist. The tranquil grounds and meditation gardens are full of buddhas and fountains, and witticisms like “The Best Revenge Is To Stop Revenge” can be found along the path. Lucky for us, there was a break in the rain that night so we were able to fully enjoy the Saturday Market. We had already been to the Chiang Mai Night Bazaar, a nightly event that is truly a shopper’s delight. The streets are lined with a seemingly endless array of booths and stalls with vendors selling everything from textiles, woodcrafts and jewelry to trendy fashions and designer knock-offs. But the Saturday Market was truly the crown-jewel of outdoor Thai markets. Just when you think you’ve seen everything there is to buy, the vendors at this market are even more unique and creative. Bowls made of sawdust and glue, hand-made jewelry, antiques and art line the streets for blocks and blocks. Everything was a bargain and it was tempting to buy it all, until the realities of luggage limits and fees entered the picture.The market is a festive environment with many street performers and musicians, some of them blind or otherwise disabled, mixed in with the aromas of “street food,” and the variety of restaurants and cafes. Along the way, we passed an old music store with Chubby Checker blaring out into the streets. Its collection of vintage vinyl was remarkable, and with our last bit of energy we enjoyed a quick “Let’s Twist Again” with the elderly gentlemen dancing out front before calling it a night.Our hotel, The Bodhi Serene, is a divine oasis in the middle of this busy city and well located to all of the sites. We found it through an excellent website for Asian travel, http://www.agoda.com. And just around the corner, our tired tourist feet were indulged with a much-needed pedicure and massage for a mere $7. The affordability and adventure of this part of Thailand naturally attracts a lot of backpackers, and there are many guest house and hostel options.